A large-scale multimedia sculpture, “Shakespeare Machine,” has been commissioned from Ben Rubin for The Public’s lobby. 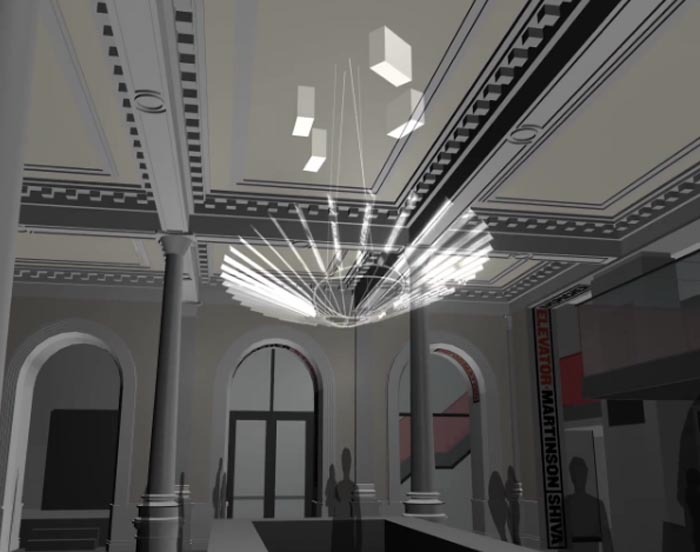 Suspended from the ceiling and serving as the lobby’s chandelier, the work features 37 display screens on which fragments of Shakespeare’s plays appear and dance, creating an unfolding kaleidoscope of language in motion. The installation is part of New York City’s Percent for Art initiative, which ensures that a portion of construction project budgets are dedicated to site-specific artworks. Upon further research I came across several Shakespeare Machines that Rubin has worked on in the past few years, as a way of working out concepts and algorithms for the Public Theater sculpture. The top three images are from the latest, and presumably final, renderings for the actual piece due to debut this coming fall. The fourth image is a previous rendering from 2009, while the fifth image is from A Shakespeare Accelerator: Experiments in Kinetic Language, a piece that is currently being exhibited at the Experimental Media and Performing Arts Center (EMPAC) at RPI in Troy, NY through the end of July. The final image is an iteration from 2009 included in the group show Textual Landscapes: Real and Imagined at Bryce Wolkowitz Gallery. 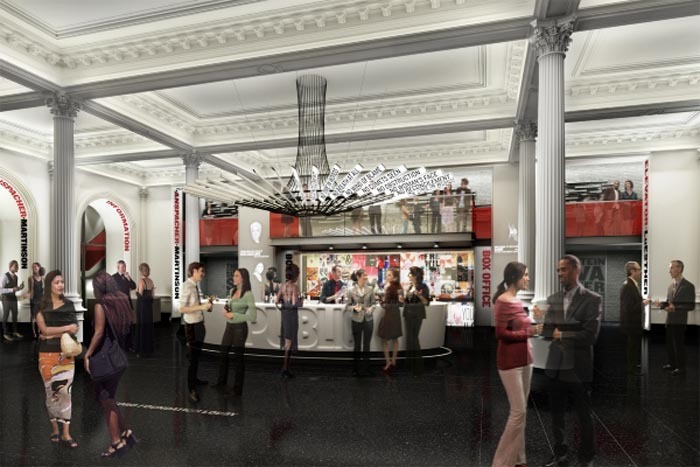 The final piece that will hang in the Public Theater’s lobby will cycle continuously through the text of Shakespeare’s plays organized as a repeating series of compositions, recombining the small linguistic molecules to form new poetic visual combinations. The nature of the algorithms ensures that no composition will repeat. I’m looking forward to checking this out. In the meantime, you can take a peek at the animated rendering here. Images courtesy of Ben Rubin, EMAC, Bryce Wolkowitz, and The Public Theater. This entry was posted in Art, Industrial Design, Interaction Design, Just Plain Cool, Light, Stuff We Like, Typography. Bookmark the permalink.